Mamoru Hosoda’s Academy Award nominated Marai arrives on Blu-ray in a stunning transfer that will delight fans of Japanese animation. Kun (voiced by Jaden Waldman) is a four year old boy who has been used to living as an only child, until one day his mother (voiced by Rebecca Hall) comes home with a new baby girl named Mirai, which is Japanese for future. He quickly discovers that he is no longer the focal point of his parent’s attention and affection, acting out in tantrums and even hitting his baby sister with his toys. This escalates when his mother decides to go back to work, leaving his father (voiced by John Cho) to watch the kids while working from home. Kun begins to go on adventures with the human form of his pet dog Yukko (voiced by Crispin Freeman), the future version of his sister Mirai (voiced by Victoria Grace), his mother when she was his age, and a younger version of his great grandfather (voiced by Daniel Dae Kim), learning about his family history along the way. He begins to accept his new baby sister and learns to respect his parents. Mirai is a strange film at times (in the eyes of an American, at least), and some of Kun’s tantrums can be quite unnerving, as well as some of the violence he inflicts on his baby sister. There are consequences for this behavior, though, and helps the viewer understand that we are really experiencing all of this through the eyes of a four year old. Director Mamoru Hosoda tells a very interesting story of what a child’s life may be like in Japan, something I at first thought would be an odd subject for an animated film, but gradually felt myself being pulled into Kun’s adventures. 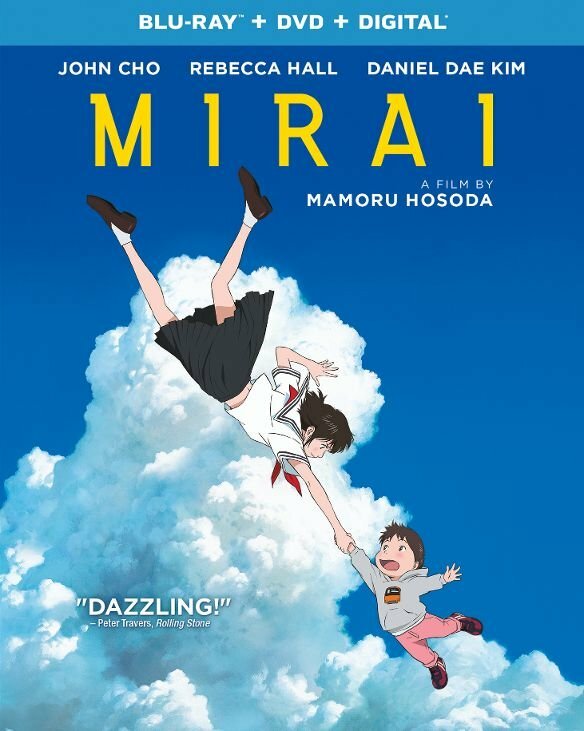 Universal has been putting out some fantastic Blu-rays lately, and Mirai is no exception. The 1080p AVC-encoded transfer preserves the film’s theatrical aspect ratio of 1.85:1 with vivid and stirring colors that are well-saturated without ever bleeding or blooming. Detail is very strong, even though this is a more traditional hand-drawn style of animation. Contrast is spot on, with bright whites and deep blacks with no evidence of clipping or crushing (the sequence in the train station near the end of the film is an excellent example of the deep blacks found in this film). I saw no evidence of compression artifacts whatsoever. Mirai contains two DTS-HD MA 5.1 tracks, one in English (which I reviewed in more detail) and its original Japanese. Both tracks are very similar from a sonic standpoint, with good dialogue prioritization that will occasionally move with the action on screen but primarily be directed from the center channel. Music and effects round out the mix’s front and surround channels, with subtle use of LFE now and again to enhance motorcycle and train sounds. With the exception of a few trailers, all of the Special Features are in Japanese with English subtitles. Interview with Director Mamoru Hodosa (1080p; 37:39): The director speaks candidly about the making of the film. Japanese Cast Interviews (1080p; 46:52): The Japanese voice cast are interviewed by Hiroyuki Amaon. “Mirai” at Cannes Film Festival (1080p; 7:39): Director Mamoru Hosoda is joined by Moka Kamishiraishi (the Japanese voice of Kun) as they travel to Cannes for the film’s world premiere. The New World of Mamoru Hosoda (1080p; 21:05): A tour of the production process with the director at Studio Chizu. “Mirai” in Japan (1080p; 34:41): The director and his Japanese voice cast attend various screenings of the film throughout Japan. Visiting Studio Chizu (1080p; 5:51): As the title indicates, the viewer is taken on a tour of the animation studio. Mamoru Hosoda Visits Toyama Prefecture (1080p; 17:58): The director is joined by Hiroyuki Amano and Moka Kamishiraishi as he tours some of the more important places in his life. “My Future” by Hosoda and Voice Cast (1080p; 3:12): The director and his cast share very brief ideas of the future. Trailers & TV Spots (1080p; 12:32): The US Teaser, US Trailer, English Trailer, 4 English Teasers, and 2 Japanese Trailers are included. More from GKIDS (1080p): Trailers for Song of the Sea, Mary and the Witch’s Flower, My Life as a Zucchini, and Only Yesterday. DVD Copy: The movie in 480p and English and Japanese Dolby Digital 5.1 audio, plus the Special Features Interview with Director Mamoru Hosoda, Visiting Studio Chizu, Trailers & TV Spots, and More from GKIDS. Digital Copy: An insert contains a code to redeem a digital copy of the English language version on Movies Anywhere. Mirai is an interesting look at family life in Japan through the eyes of a four year old. Universal’s Blu-ray release features outstanding video and audio and a wealth of extras. How can I pick out the best broker from those listed on this site?